Everybody can make cornbread, and there are a zillion recipes for it out there. 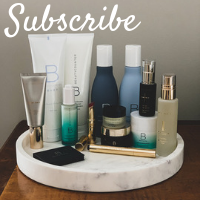 Why not try something different? 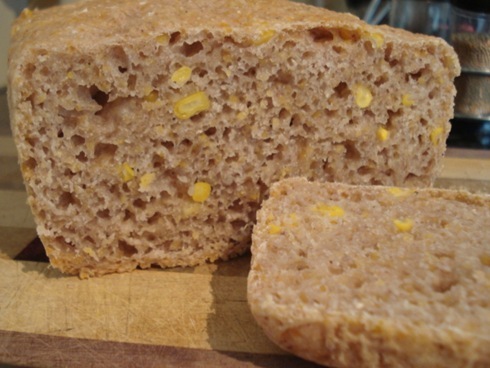 This recipe isn’t so much a cornbread, but a corn-flavored bread. Instead of using chemical leaveners, I relied on my fun guys, yeast! As with any yeasted bread, we have to have a way to trap the gas produced during fermentation and the steam produced during baking, or we won’t get any leavening, and nothing traps gas like a glutenous web! 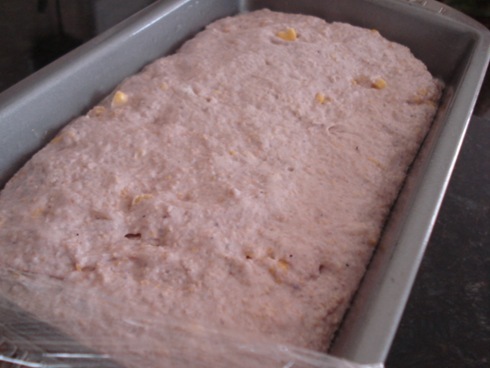 What this means for this recipe is, we have to use a significant amount of wheat flour. I worried that this would diminish the flavor of the cornmeal, so I thought adding some corn kernels would boost the corny flavor. Now on to the recipe! I did my usual method of pre-fermenting a large portion of the flour (with sourdough if you got it) but if you want to emphasize the corn flavor above everything else, this could be made in one day without any prefermentation. 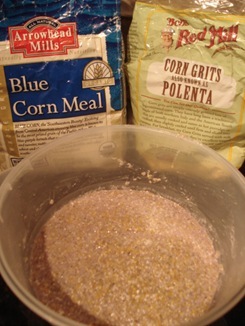 The first step is to hydrate the cornmeal/grits. I chose to use a mixture of 50g blue cornmeal and 75g yellow grits. I figured the grits would add a bit more texture, but my concern was that the sharp pieces would tear the gluten. That’s why you have to start this recipe by letting your ground corn sit in water for 15-30 minutes. Just use a portion of the total water in the recipe, and then combine it all when you mix the final dough. If you don’t cook using a food scale, consult your package to estimate how many cups is 125g. 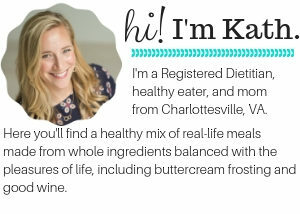 Next thing to do is cook your corncob. I chose to grill mine for two reasons: 1) grilled n’ charred corn is delicious! and 2) this would reduce the amount of water in the kernels. You know I’m always concerned about the ratio of ingredients in my doughs, and any extra water might throw things off. 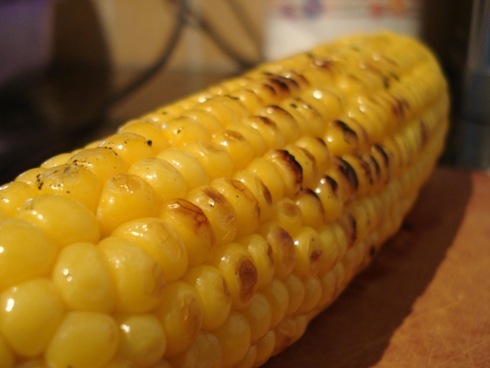 If you choose to boil your corncob, keep in mind that you may not need all 350g of water. 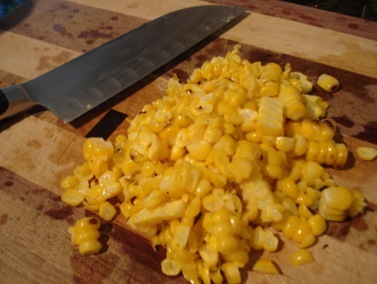 After it’s finished cooking, cut it right off the cob. Don’t worry about cutting too deeply, the corn will let you know when you’re cutting into the wood. Once you’ve done these things, put everything into the mixing bowl and mix until you have THOROUGH gluten development. I have to say, I mixed this dough MUCH longer than any other dough before. It just kept being all runny and oozy. 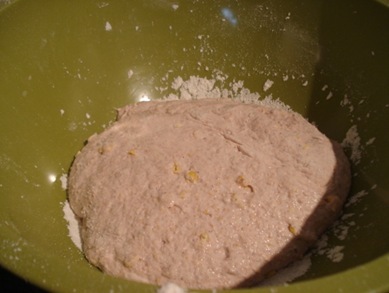 Once dough is finished mixing, place in a bowl, cover with plastic, and let rise until doubled in size (picture is before rise). After a nice rise, fold the dough to disperse the gas and redistribute. 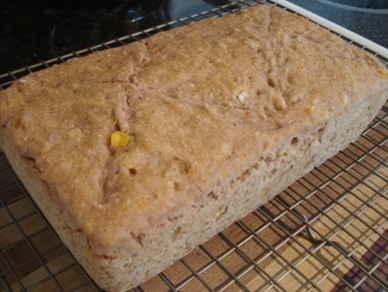 Then shape into desired loaf (I went with a loaf pan). Allow to rise for another 45 minutes. During this final rise, preheat the oven to 420*. Bake for 25-29 minutes, and enjoy!